Riley is so into cars, it's crazy. He tells me all day every day about the fastest cars in the world, and loves Mustangs, Ford GT's, Bugatti's, and Lamborghini's. When I heard about the Design Masters Sketchbook I knew he would love it! It comes with 250 stickers so the kids can personalize their designs. Each page has a blank car to design with their own drawings and stickers. Use the detailed Ford GT stencil sheets provided to trace cool car parts on your sketch page, add some color and some smoking' sticker appliques and you've just detailed your ride. The kit includes 30 sketch pages, over 50 stencils, 2 illustrated inspiration sheets, more than 250 stickers and instructions. 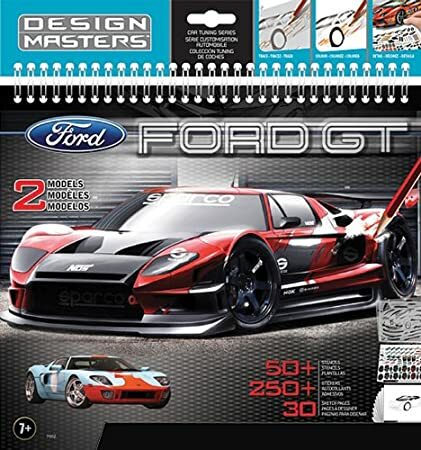 Design Masters Sketchbook combines precision drawing with sophisticated design and allows children to create their own styling' rides by drawing, sketching, personalizing and detailing their own car designs. You can purchase the Design Masters Sketchbook on Amazon.